Rating: PG-13 for violence and disturbing images. Of all the magic films you might have seen, this film will make you sit up and start taking magic seriously. And yes, Christian Bale's acting will surprise you; completely non-methodical and he fits his role like a glove. Scarlet Johnson is more like a distraction and fails to add anything to the film. But this is not what we should be talking about, we should be talking about the world created by the magical duo of Christopher and Jonathan Nolan. And if you have read the novel on which the film has been based on, you will not take long in realizing this duo's potential. Not only did they add more details to the plot but created a cinematically intriguing screenplay. "Every great magic trick consists of three acts. The first act is called The Pledge: the magician shows you something ordinary, but of course... it probably isn't." Perhaps you may find it very whimsical, but the narrative of the film is like the above quoted text, the film is itself like magic; you won’t know the secret until the end, the film makers take a pledge, and as the film wraps up, you still are left with hardly the rightful answers. Did they trick you!! Deny you the truth and made you believe, may be you were on the wrong track from the very beginning. character a unique amount of depth. All this aside, Michael Caine is the anchor, providing the air of wisdom and neutrality needed from a mentor-like character in a film like this. On a whole, the cast works very well, especially together. "The second act is called The Turn. The magician makes his ordinary something do something extraordinary." The narrative is complex and hardly the mastery of it can be ignored when you have duo at work. I would assure you; however, that what follows the film’s unusual setup is as vividly performed, compelling and surprising as any screen narrative in recent memory. 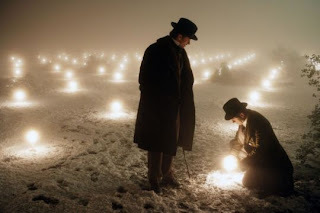 Nolan mixes period detail about the performing of illusions with intriguing ideas about the frontiers of science and the complexities of human relationships; the film is as intoxicating in its depiction of trickery as it is evocative in its examination of loneliness and deceit. "Now, if you're looking for the secret... You won't find it. 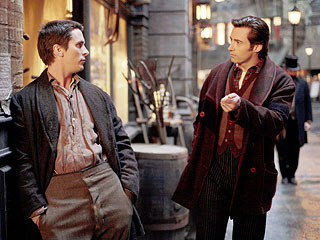 That's why there's a third act called, The Prestige. " This is the part with the twists and turns, where lives hang in the balance and you see something shocking you've never seen before. The end will shock you but like any magic, when the secret is revealed, you will laugh it off saying: "I knew it all from the very beginning"
Don't fool yourself in believing that. There will never be a greater movie about the art of magic.